Sweat is a weak salt solution produced by the eccrine sweat glands. These are distributed over	the entire body but they are most numerous on the palms and soles (with about 700 glands per	square centimetre). The sweating usually reduces at night time and disappears during sleep. The exact cause or causes of hyperhidrosis are unknown. It appears to be due to overactivity of the body temperature centre in the brain (the hypothalamus) or of the sympathetic nerves that control the sweat glands. Primary hyperhidrosis first appears in childhood or adolescence. It may persist lifelong, or improve with age. Other family members may or may not be similarly affected. It tends to involve both armpits, palms and or soles symmetrically. 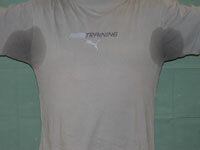 What is the result of excessive sweating? Hyperhidrosis is an embarrassing complaint and significantly interferes with many daily activities. Clothing becomes damp and unsightly and must be changed several times a day. Wet skin folds are prone to chafing, irritant dermatitis and infection intertrigo). It is embarrassing to shake hands and it difficult to write neatly. Damp fingers may cause electronic equipment such as keypads and trackpads to malfunction. Frequent handwashing may result in dermatitis. Sweaty feet develop an unpleasant smell, ruin footwear and are prone to dermatitis or secondary infection tinea, impetigo or pitted keratolysis). Wear loose fitting garments made of fabric that does not stain. Try garments that are specially designed to absorb sweat and reduce odour. Microfibre pyjamas and porous sheets may increase night-time comfort. Expect to change your socks several times a day. Try those scontaining silver or copper. Use absorbent insoles in shoes and replace them frequently. Don't wear the same pair of shoes two days in a row; leave them to dry out and increase their life span. Specific footwear dryers are available. Use talcum powder or corn starch powder after bathing. Avoid foods and drinks that conain caffeine (coffee, tea, cola drinks, chocolate). Antiperspirant sprays, sticks, roll-ons, wipes and paints are available. Choose an unfragranced aluminium salt preparation suitable for hyperhidrosis (10-25% in alcohol or as a gel). Aluminium salts are sometimes combined with salicylic acid to enhance penetration. Antiperspirants should be applied when the skin is dry, after a cool shower just before bed. Wash off in the morning. They should be used for several consecutive nights then once or twice weekly. The stronger products can irritate; if so, apply hydrocortisone cream for a few days. Note: 'deodorants' are fragrances designed to disquise unpleasant smells, and may contain antibacterial substances. They don't affect the amount of sweat produced. A dusting powder containing diphemanil 2% may be useful for mild hyperhidrosis. Apply between the toes, under the breasts and other skin folds. Topical application of glycopyrrolate, an anticholinergic medication. Iontophoresis is provided by some hospital departments for hyperhidrosis of palms, soles and armpits. Battery-powered units for home use are also available. The affected area is immersed in water or an electrolyte solution. A low electrical current is passed across the skin surface daily for 20 minutes or so. This is repeated for several weeks and may reduce or stop sweat production. Treatments are then required weekly or less often. Iontophoresis may cause irritation or dermatitis, and is not always effective. The anticholinergic drugs, oral propantheline (Pro-banthine®), oxybutynin (Ditropan®) and glycopyrrolate (Robinul®) may reduce sweating, but unfortunately can cause blurred vision, dry mouth, constipation, dizziness and palpitations. They should not be taken by those with glaucoma or urinary retention. Beta blockers may also be helpful as they block the physical effects of anxiety. They are unsuitable for those with asthma or peripheral vascular disease. Calcium channel blockers, nonsteroidal anti-inflammatory drugs and anxiolytics may also be useful for some subjects. Botulinum toxin injections into the armpits are increasingly popular as they can reduce or even stop sweating for three to six months. Botulinum toxin is also effective for the palms and soles, but is not yet licensed in New Zealand for this purpose (June 2008). It may temporarily weaken the small muscles of the hands. Regional or local anaesthesia is desirable in these sites as the injections are painful. It has been used for localised hyperhidrosis in other sites and has proved particularly useful on the face, for example in gustatory hyperhidrosis (sweating provoked by eating). Overactive sweat glands in the armpits may be removed by several methods, usually under local anaesthetic. Surgery to cut out the sweat gland-bearing skin of the armpits may be performed using local anaesthetic. If a large area needs to be removed, it may be repaired using a skin graft. The overactivity of the spinal sympathetic nerves can be reduced by chemical or surgical sympathectomy and may considerably reduce sweating. The most common procedure is endoscopic thoracic sympathectomy (ETS). This is quite a major procedure and is performed in hospital under general anaesthetic. The second thoracic T2 ganglion is cut, clamped or burned to treat facial sweating, and the third thoracic T3 ganglion is treated to treat hand and armpit sweating. ETS is effective for up to 95% of patients. Unfortunately the effect may not be permanent (hyperhidrosis recurring in up to 15% of cases), and it is often accompanied by undesirable skin warmth and dryness. Compensatory hyperhidrosis on other sites of the body occurs after surgery in about 50% of patients, and is severe in 2%. ETS risks serious complications such as Horner's syndrome (due to injury to sympathetic nerves to the face), pneumothorax (collapsed lung, in up to 10% of patients), pneumonia and persistent pain (affecting less than 2% of patients). Sympathectomy is therefore reserved for the most severely affected individuals. Lumbar sympathectomy is not recommended for hyperhidrosis affecting the feet as it can interfere with sexual function.